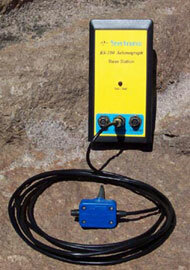 The RS-100 Seismograph has been discontinued. To see other current models from Seistronix click here. The RS-100 is an innovative new instrument designed for shallow subsurface exploration on a budget. The RS-100 utilizes state-of-the-art 24-bit signal conversion, a wireless trigger link (or cable) and interactive stacking software to allow a one or two-man crew to perform many types of geotechnical surveys that were once only possible with more expensive multi-channel seismographs. The system is comprised of the RS-100 base station and tri-pod, RS-100 radio trigger, geophone, hammer switch, striker plate, hammer switch extension cable (300 feet) and laptop serial interface cable. Simply plug the hammer switch into the radio trigger, and the geophone and laptop into the RS-100 base station and youre ready to run a survey. A typical field setup is illustrated below. In operation, the base station, geophone and laptop stay at the beginning of the seismic traverse, while the operator strikes the plate with a sledgehammer one or more times at points farther and farther away from the base station. 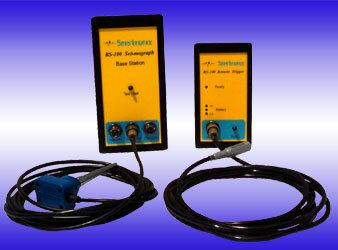 Depending on the desired detail and depth of interest, the station intervals commonly vary from 5 to 20 feet. Successive strikes at each location (station) are recorded and grouped together for display and storage. When all stations have been recorded, you may then selectively stack the data to produce a continuous profile similar to the types of records produced by multi-channel seismographs. The user may then use the first break picking facility to choose the first arrivals and plot the results. The base station amplifies and digitizes the low-level signal from the geophone and transfers the result to the laptop for display and analysis. The small, lightweight (< 2 lb) base station operates on four AA batteries and utilizes a low-noise preamplifier and high resolution 24-bit A/D signal conversion to ensure that the largest and smallest signals are recorded with precision. Trigger signals from the radio trigger are processed by the base station to provide the timing information that allows precise determination of first arrivals. The RS-100 radio trigger detects the impact of the hammer from the hammer switch and sends a timing signal to the base station through a radio link that establishes the beginning of the recording time for the system. The wireless link eliminates the hassle of dragging cables and reels through rough terrain and allows a single operator to conduct a survey. If the terrain prevents the use of the Radio Trigger (i.e., dense foliage or hilly terrain), the hammer switch extension cable may be used to complete the survey. 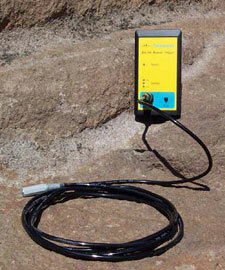 The RS-100 software makes the job of collecting and interpreting data easy. Data from every hammer blow is stored in a single raw data file that is then selectively stacked to form a continuous profile, allowing first arrivals to be tracked from station to station. The interactive first-break picker, velocity analysis and other interpretation software allow you to get the answers you need right in the field. For more information on how the new RS-100 can help you solve a wide range of geotechnical and engineering problems, please contact Seistronix.